New London — Extolling the region’s links to the sea, Gov. Dannel P. Malloy, Lt. Gov. Nancy Wyman and other dignitaries spoke Thursday morning at a Fort Trumbull State Park ceremony marking the start of the sixth annual Connecticut Maritime Heritage Festival, which continues through Sunday. 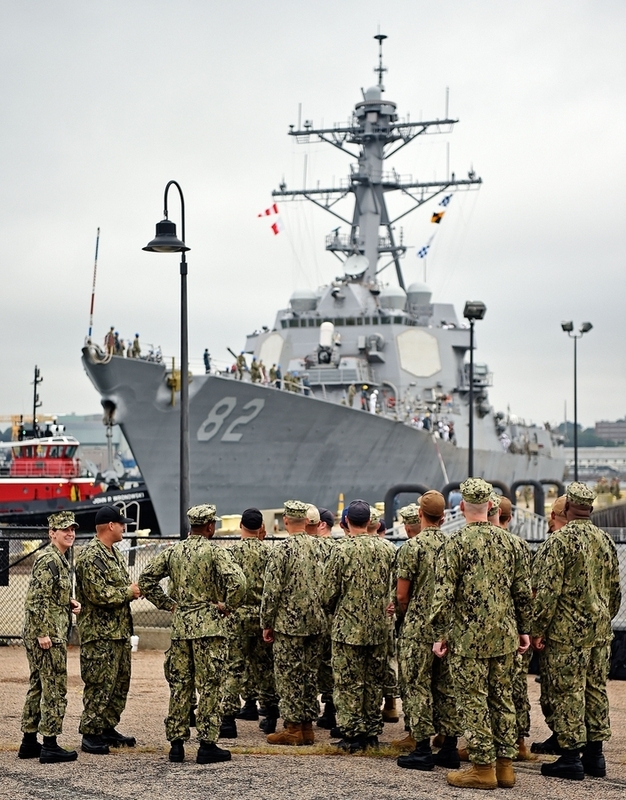 Behind the podium, the superstructure of the USS Lassen could be seen rising from Pier 7, where the guided-missile destroyer had docked hours earlier, having cruised from its homeport in Jacksonville, Fla.
Mayor Michael Passero said it was fitting that New London hosts the annual festival, given the Whaling City’s connections to the Coast Guard and Navy. He hailed Malloy’s steadfast support of the event and the city in general during his two terms as governor. “The two of you have graced this city,” Passero said, addressing Malloy and Wyman, who he said have visited the city more frequently than their predecessors. Neither is seeking re-election. “You really need a residence in New London,” Passero said. Malloy said that when he took office in 2010, New London “hadn’t gotten a fair shake in a long time,” a circumstance he’s sought to rectify through the state’s commitment to reviving the city as a commercial port. “New London’s on the rise,” he said. Navy Cmdr. Ryan Ventresca, commanding officer of the Lassen, said the ship’s 315-member crew was honored to participate in the festival. Rear Adm. Andrew Tiongson, commander of the First Coast Guard District in Boston and a 1989 graduate of the Coast Guard Academy, noted that the maritime festival didn’t exist when he was a cadet in New London. Now, he said, the city is the future site of the National Coast Guard Museum. “I’ll be collecting donations in a minute,” he quipped. During the ceremony, two East Lyme fishing charter operators — Marc Berger, 66, and his son, Michael Berger, 30 — were honored for their July 21 rescue of four fishermen who jumped into waters off Niantic when their boat began sinking. According to a Coast Guard citation, the Bergers were operating a charter excursion aboard their vessel, Lucky Strike, when they spotted the fishermen in the water. Marc Berger steered the Lucky Strike “through rough chop, three knots of current and 20-knot winds," while his son prepared rescue operations, eventually throwing a life ring to each of the men and pulling them in one at a time. “Most of the credit goes to Mike,” said Marc Berger, who is president of the Connecticut Charter and Party Boat Association. Nearly a dozen ships, including Coast Guard cutters, merchant marine vessels and an array of schooners — some of which docked Thursday at downtown New London piers — were scheduled to participate in the festival’s Parade of Ships along the waterfront, starting at 11 a.m. Friday. All of the ships, including the Lassen, will be available for free tours from 10 a.m. to 4 p.m. Friday and Saturday and from noon to 4 p.m. Sunday. Adults seeking to tour the Lassen will be required to show a photo ID.